So a week ago I attended my first ever Protein Pow workshop – and it was amazing! I wanted to share my experience because it was the best day ever, I loved connecting with like-minded people and was SO excited to make, wait for it, protein PIZZA!! I’ve been a huge fan of Protein Pow for a long time – I remember many years ago when Steve came back from his first BodyPower Expo with Anna’s protein cookbook, and we set about making our first ever protein pancakes. Me and Anna at the Protein Pow cooking workshop. It was the beginning of my love for protein cooking, so when Anna asked me to become an ambassador for Protein Pow last year, it was a huge milestone for me and something I’m hugely proud of – to be able to work with one of my favourite brands is just a dream! 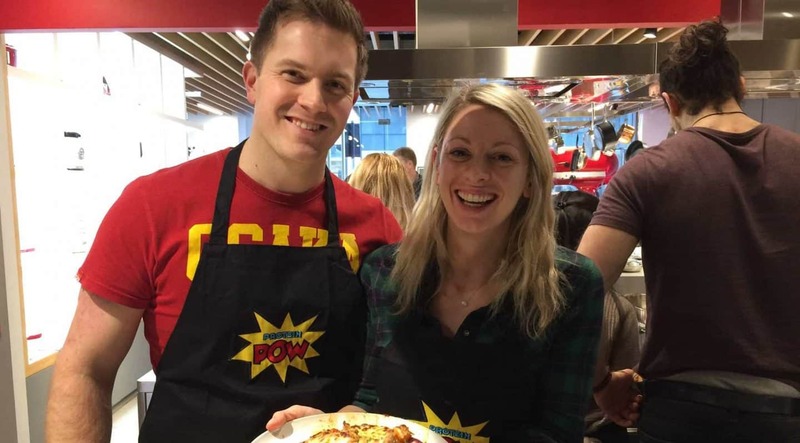 I was even more excited to be invited to one of the Protein Pow cooking workshops in London, and so Steve and I hopped aboard a train to London and made our way to the KitchenAid store in central London. At the workshop I met some AWESOME people, including Lewis from Oxford Fitness, Dominique, aka Daily_Dominique, and Charlie, aka the Twisted Swede – plus lots of new ‘pow friends’ who I’ve enjoyed connecting with on social media. 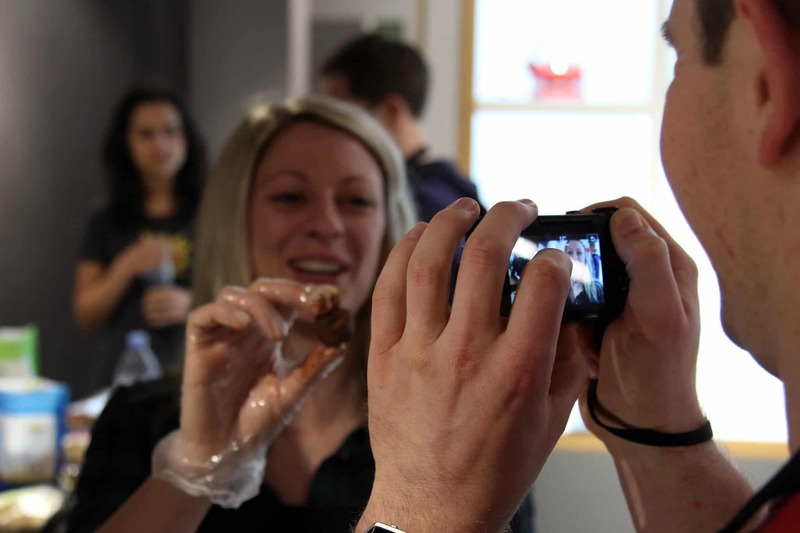 There was such a brilliant vibe in the room despite the differing levels of experience when it came to protein cooking. Some, like myself, had dabbled quite a bit before, while others had never cooked with protein. Despite this, everyone was keen to get involved, have a play and come up with some protein creations. First of all we made bars and truffles. I used both the pea and whey Protein Pow mixes to come up with several different bars. I took the opportunity to play with some new ingredients – including agave nectar and stevia. It was great fun to just have a play and make a mess – and everyone helped each other. I loved looking at what everyone else had created – I coated some of my truffles with dark chocolate, topped with goji berries, and some I stuffed with some Pip n Nut cashew butter. Next up was what I had been waiting for – protein pizza!! This was SO easy to make, tasted absolutely delicious and was a really easy way to come up with a pizza which fits your macros. It’s made in a frying pan and after putting it together, it was great to share this with the rest of the group. Overall this was just the best day! It ran from 11am-3pm and everyone got a goodie bag afterwards with some treats and one of each of the Protein Pow mixes. Seriously, for £45, this is so worth it – I’d definitely recommend it to anyone. A big thank you To Anna at Protein Pow for inviting Steve and I along to the workshop, and to Will and Charlie for their help on the day! Check out Protein Pow here and find loads of amazing recipes, buy the mixes and book a workshop!